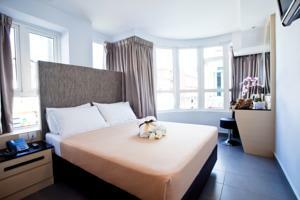 Fragrance Hotel – Elegance is a 10 minute walk from Bugis MRT Station and Pargo Bugis Junction Mall. Centrally located, the hotel has a 24-hour front desk. Air-conditioned guest rooms include tea/coffee-making facilities, a DVD player and a flat-screen TV with cable channels. The private bathroom comes with toiletries and a hairdryer. There is an internet corner at the hotel’s lobby. Luggage storage can be found at the 24-hour front desk. Elegance Fragrance is a 10 minute walk from Little India MRT Station and the 24-hour Mustafa Centre Shopping Mall. It is a 15 minute drive from the popular Orchard Road. Rooms: Hotel Rooms: 31, Hotel Chain: Fragrance Hotel. Wi-Fi is available in all areas and costs SGD 18 per 24 hours. Free! All children under 5 years stay free of charge when using existing beds. There is extra beds/baby beds in a room is 0 capacity for extra beds/cots in the room. Visa, Euro/Mastercard, JCB The hotel reserves the right to pre-authorize credit cards prior to arrival.